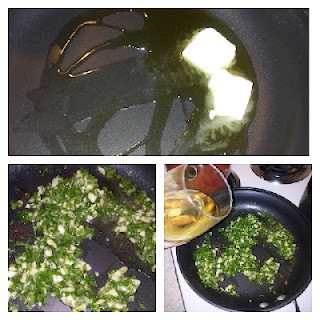 5-6 Cloves of fresh Garlic...save yourself the aggravation and get the pre-peeled...yes, it is a little more but we are busy, and who has time for such nonsense?? 2TB stick butter or margarine. One lb of Pasta-I am a big fan of Dreamfields Pasta, Linguine or Spaghetti-using this takes a lot of guilt away, it has fewer digestible carbs, and about the same high fiber as whole wheat pasta, It tastes awesome and you will never know the difference trust me! 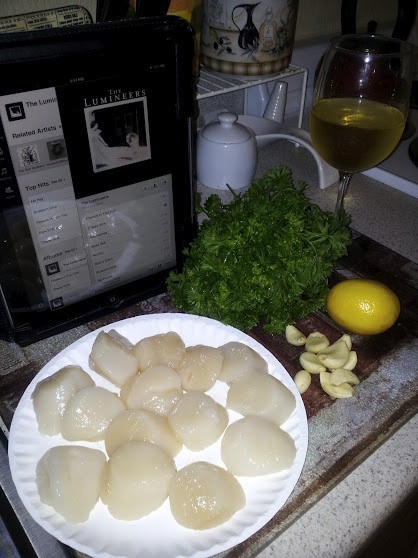 Pour some wine, set up your music and rinse your scallops. Put them on a paper plate (I am lazy, saves dishes and season them with garlic powder and Cavendears, I also like Seafood Magic. In a food processor take your garlic and parsley and process it so it is finely minced.Heat a medium sized frying pan over medium heat and add olive oil and two slabs of butter. Add your garlic/parsley mix and simmer for about five minutes till the onions are clear. Then take a little wine out of your glass and add to your mix and cook for another couple of minutes. You should start to boil the water at this time. This is when you have to pay attention. 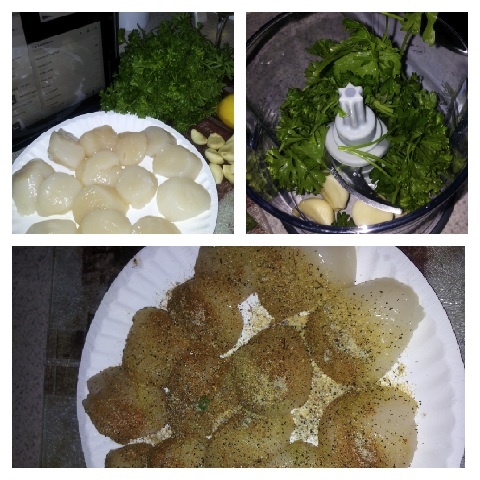 Add your scallops to your garlic parsley awesomeness and under medium heat begin cooking the scallops moving the mixture over the scallops to cover them. You may need to add a little olive oil. After about 4 minutes flip and re-season. At this time your pasta should be underway, you want to time everything to come out at the same time. You want the scallops to be white...be careful they can get overcooked quick. Right before the scallops are done, throw in the shrimp and get them into your mixture. Since they are already cooked, they just need to be heated through. I usually drain the pasta and add it to the frying pan, it is just easier. 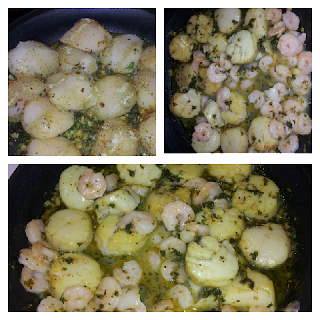 Mix well and add olive oil and maybe a little bit of margarine or butter to loosen it up. You want the consistency to be wet, not soupy. Mange! 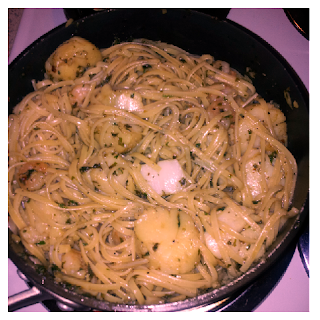 I am big fan of seafood pasta.. one of my favorite dish for dinner.. thanks for sharing this post looks so yummy..